Tanglewood Park in Clemmons, NC, just west of Winston-Salem. We ate so much that we didn't need to eat dinner when we came home - and we didn't leave the picnic till after 6 or 7p. I had made a big (7 quarts, I believe) potato salad; I used (all organic ingredients) Yukon Gold potatoes, vegenaise, celery, capers (oh, those may not have been organic), dill pickles, dill weed, red onions, and more. We had some set aside for ourselves, and enjoyed that with dinner tonight. Sangeeta's manager made a very nice tabbouleh (which I find not so easy to make well, but hers was excellent! ), and we had some of that again tonight. We finished up the chard that we had made a few days ago and I sauteed the remaining smoked tempeh ("fakin' bacon") that we had left in the refrigerator. I had very little time after errands before attending tonight's American Dance Festival performance, so quickly put together a simple dinner. 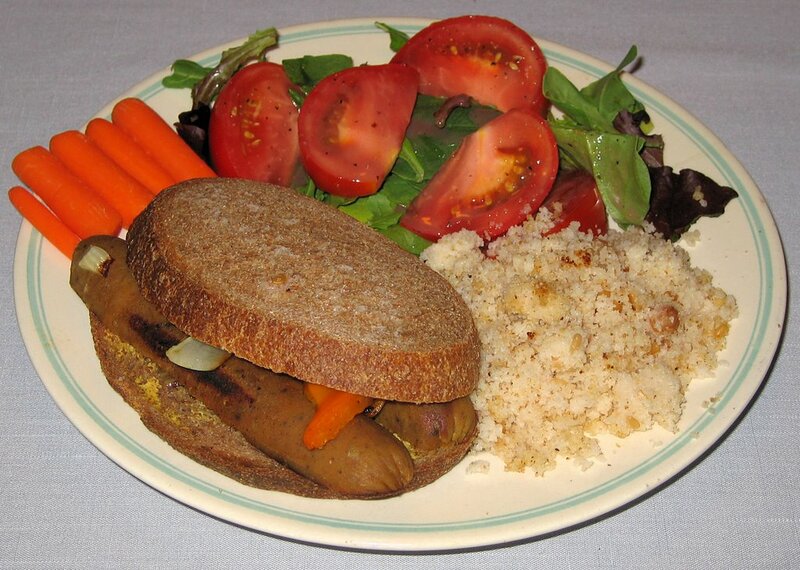 I sauteed in a small amount of oil vegan apple-sage "sausage", bell pepper, and onion, and served it on toasted whole wheat sour dough bread with mustard and hot sauce. We had enough of my wife's South Indian uppama semolina leftover from a few days ago to finish tonight, and served it with bottled lime relish (not shown here). I've cooked with chard, a great source of potassium and vitamins A and C, and an abundant provider (providing over 4 times the daily requirements) of vitamin K, before, but this was the first time that I used the chard stalks. I started with a lovely bunch of organic rainbow chard and, leaf by leaf, I carefully rinsed and then, by hand, pulled off chunks of the leaf. I took all the stalks and cut them into thirds; I left the topmost portions of the stalks with the leaves if they tapered to become quite thin. I then started some onions and shallots sauteing in extra virgin olive oil (which is the oil I use almost all of the time, with occasional use of canola and very occasional use of sesame or grapeseed). A minute or two into the saute, I added the chopped stalks. I stirred periodically and cooked till the onion was clear and the stalks were soft. Then I added some cumin seed and chopped ginger, and the hand-shredded leaves. I sprinkled salt on top of the leaves to help them to shrivel and cook down, and covered the pan for a minute or two, then stirred everything together. I lowered the heat to a low-medium and kept the large pan covered, stirring every few minutes for a total of about 5 minutes till the leaves were wilted; in the last few minutes, I also added some delicious sweet orange bell pepper slices. I sprinkled some additional spices, such as hot chili pepper, on top and mixed in before serving. I also made some brown basmati rice (cooked in vegetable broth as I usually do). I toasted some seeded ciabatta (Italian "slipper" bread - named due to the shape) and put hummus on top. Celery with baby carrots and olives rounded out the meal. It's been a while since I've had the pleasure of cooking, and even tonight I didn't have a lot of time to cook. After working out earlier in the evening, I had an urge to have a hearty sandwich, which I don't usually like at dinner time. I also don't generally like meat analogues, and don't cook with soy-heavy ones as they bother my wife's digestion. 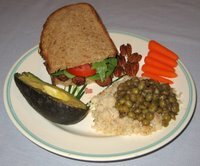 But we love tempeh and I bought some smoke-flavored organic "fakin' bacon" strips of tempeh, sauteed them in a little bit of oil briefly till crispy, made some toast and spread both pieces with organic grapeseed oil-based vegenaise, and included tomato and lettuce to make a vegan version of the "BLT" sandwich. Speaking of the bread, we picked up some excellent La Miche traditional French country bread from Weaver Street Market, a source of great bread! We hadn't had this bread before but really enjoyed its intense sour flavor and significant whole wheat composition. My wife had made yesterday for brunch some South Indian uppama semolina and sprouted dry peas, and I served that as well. I continue to be disappointed often with organic avocadoes, which often have significant brown overripe sections inside, but included a half with each dinner plate. Thursday night, after a class I teach, I had dinner with my wife, two students, a friend on the eve of his birthday, and that friend's girlfriend. We ate Ethiopian food at Queen of Sheba's in Chapel Hill (my wife and I enjoy Ethiopian food and found this restaurant to be worth visiting again, though I wish they had small plates to hold the injera bread). On Friday, we enjoyed the Pilobolus performance (Pilobolus is my favorite dance troupe!) at the American Dance Festival and ate with a friend at Anotherthyme in Durham (nice atmosphere but not many vegan options; we were underwhelmed by our curried vegetable dish without rice, which was only available cooked in chicken stock). On Saturday, a friend invited us to a St. John's Festival (Noite de São João) party at Duke University's International House with traditional Brazilian food. Tonight was the American Dance Festival Musicians' Concert and we didn't have much time beforehand for dinner, so I came up with a quick but tasty dinner. About a week and a half ago, I had made Baby Okra and Tomato, and had leftovers that kept well in the refrigerator. I heated that up; it ended up tasting even better than we remembered the freshly cooked vegetables tasting, due to the time for all the flavors to mix together. I served them over ramen noodles. 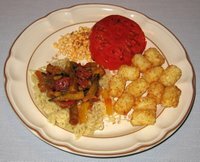 My wife had sprouted some channa dhal lentils and I served them, as well as heating some organic Cascadian Farm Spud Puppies (tater tots, or shredded potatoes). It seems like a while since I've cooked! I was in Winston-Salem over the weekend attending a course on judging rose shows and taking an exam to see if I can start on the path of qualifying to be a judge. On Saturday, we went on in the evening to Charlotte, where we attended a surprise bridal shower party and ate there. On Sunday, we took my parents out for Father's Day to Tower South Indian Restaurant. 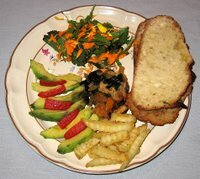 Yesterday, I had a photography meeting; I quickly made some bagel sandwiches before the meeting then came home to eat some semolina and vegetable based dish that my wife put together, along with some other leftovers. 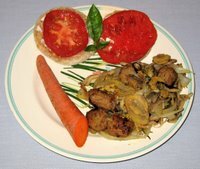 Today I sauteed mushrooms, onion slivers, and Nate's Italian Style vegan 'Meatballs', adding rice noodles that I had soaked in hot water for about 10 minutes when everything was well cooked. I added some hot sauce and spices, and cooked for another minute or two. 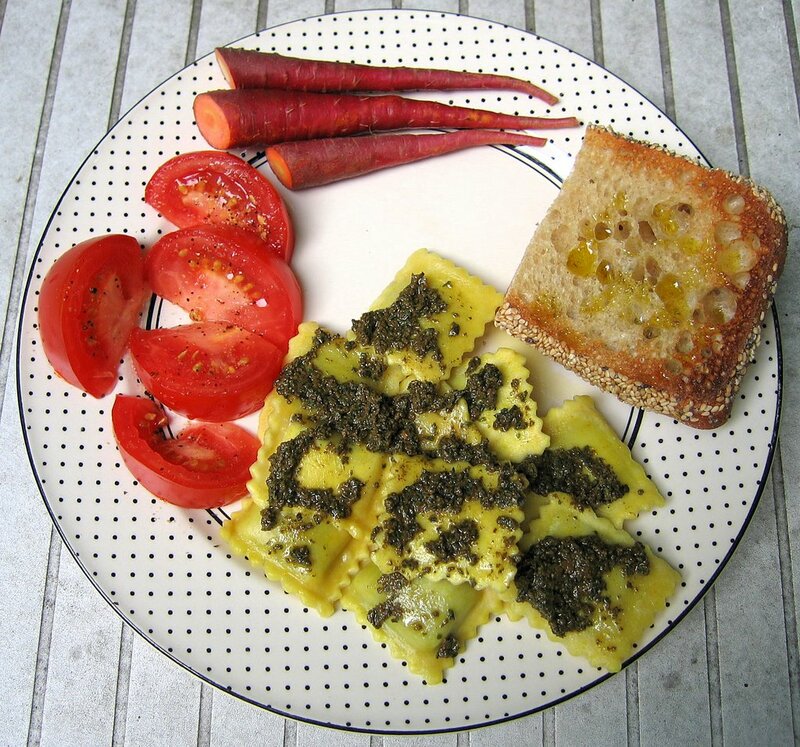 I served this with English Muffins topped with organic Vegenaise®, fresh basil, and tomatoes. We had little time tonight as we were going to an American Dance Festival performance. Like I did in late May, I prepared some frozen vegan Rising Moon Organics ravioli , this time Spinach Florentine - it was also very tasty. I love Weaver Street Market's seeded ciabatta "slipper bread", and served a toasted piece with artisanal Greek olive oil. Some carrots and tomatoes rounded out our meal that we enjoyed outdoors on our deck. Yesterday evening I taught. My wife brought over some of my Mom's very nice homemade pizza, which we ate as a picnic before making an evening of entertainment in downtown Carrboro. 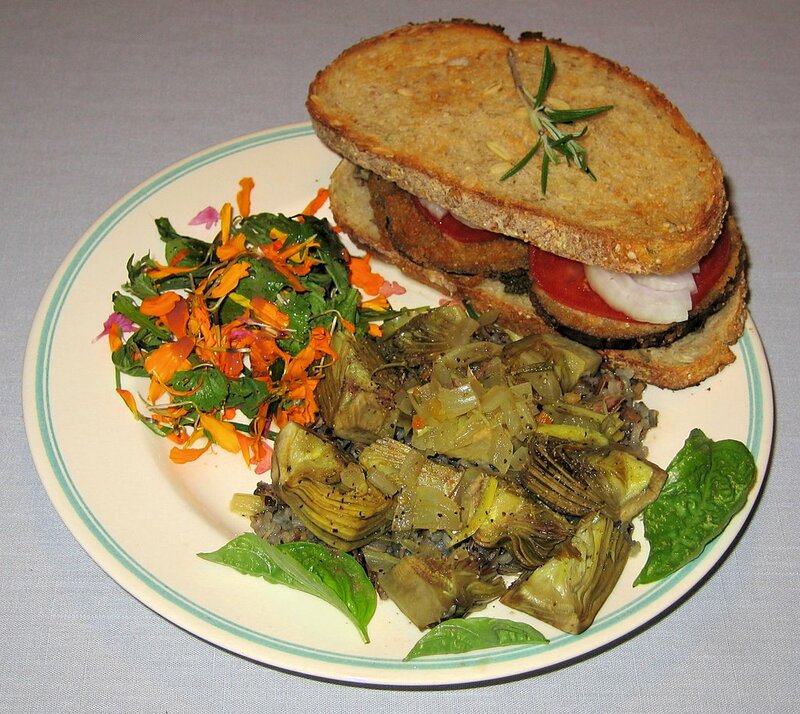 About a month ago, I had referenced a farmer's web page with artichoke recipes that inspired a meal. Today I found good baby artichokes in the store, and remembered some ideas from that web page to come up with what I think is one of my best dinners in recent memory. I started some vegetable broth going (it's easy to make broth, but I usually start with a Rapunzel brand organic bouillon cube) and added diced onions and fresh herbs from my garden. I prepared the baby artichokes as I did last time, by pulling off the outer leaves till I got to tighter and lighter colored ones, then I cut the top third or so off as well as the bottom, and quartered the heart. I put the quarters immediately into a bowl with a little lime juice to slow down browning. When the quarters were all ready, I put them into the simmering broth, cut side down (though I later thought maybe the thicker side needing more cooking may better be cooked face down - maybe I'll try that next time). There was enough broth in my pan to not quite cover the hearts. I reduced the heat and simmered, covered, for about 20 minutes till the hearts were tender. I served the artichokes plus broth on top of leftover wild rice that I heated, and added black salt and Key Lime seasoning. I also made a hearty sandwich on a multigrain toast with pesto sauce, breaded eggplant, and thick slices of onion and tomato. I had some kale waiting to be cooked and wanted to try something different. 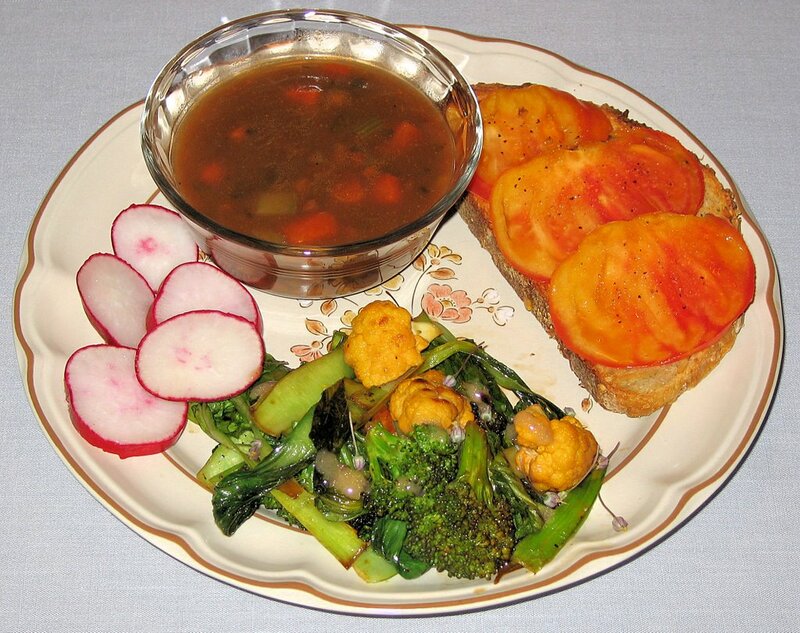 I started by sauteeing Yukon Gold potatoes that I cut into fairly small pieces. I added some Indian spices like turmeric and a few minutes later added onion and small chunks of seitan (wheat gluten). 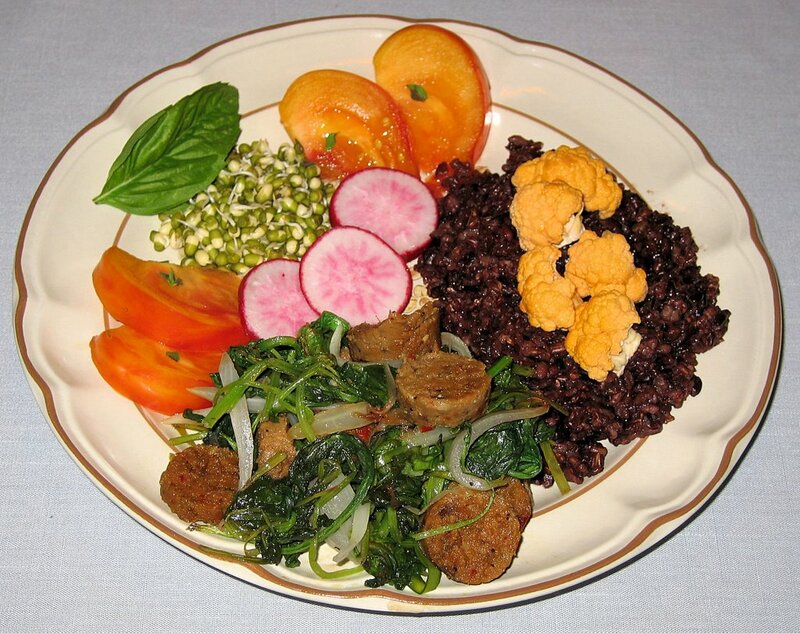 I served this with leftover Himalayan Red Rice. 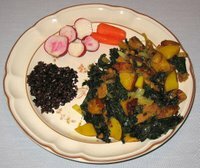 I thought that the dish came out reasonably well, but not great - but my wife really enjoyed the Indian influence on its taste. Yesterday was my wife's birthday! I successfully surprised her with a nice party at one of our favorite restaurants, Café Parizäde. We had about 20 folks enjoying a choice of two starters (a salad or a cold soup), three main courses (risotto, polenta, or grilled vegetables), and delicious coconut milk-based chocolate-raspberry birthday cake. It was getting fairly late on Sunday and I wanted to put together a quick meal. We had eaten out on Thursday at Sage Cafe and had some of my wife's pasta leftover (I recommend the restaurant, though this pasta dish was fine but not very exciting - I love their signature pomegranate reduction!). 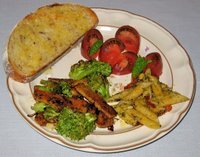 I made a simple stirfry with tempeh and broccoli, and served some heirloom tomatoes with basil from my garden as well as delicious onion-potato-rosemary bread lightly toasted. This afternoon while shopping at Weaver Street Market, I found some very nice looking baby okra, locally grown and organic. I sauteed it with onion, added a number of spices including fennel seed, paprika, crushed red pepper, and salt, and then when it was soft and cooked, simmered it for a few minutes longer in some crushed tomato to come up with a dish that was a variant on an okra one that I teach in my Ethnic Vegetarian Cooking class. 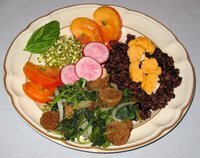 I made some Himalayan Red Rice in vegetable stock and served a salad, including some lovely French radishes that I purchased this morning at the farmer's market. And I discovered a new bread today at Weaver Street, which makes some of the best bread around! This was a bread only made on Saturdays, an onion-potato-rosemary one. It is heavy and tasty - either as bread or just warmed in the toaster oven. I served some bread with Earth Balance spread as well. Last night, we were again at Weaver Street Market, this time to eat dinner while we saw an Italian multimedia dance performance artist group at 6p; we then rushed off to catch the second night of the American Dance Festival. I taught on Thursday, and we went out with several students and a friend to Sage Vegetarian Restaurant, where I ordered what I usually get, their unique and delectable pomegranate reduction with tempeh over brown rice. Tonight I made a saute mostly with ingredients I had bought fresh from the local farmer's market on Saturday. I started with some thin slices of garlic (not from that market) in hot olive oil and soon thereafter added baby bok choy. After a few minutes, I added lovely orange cauliflower (also known as golden or yellow cauliflower) and broccoli. A few minutes later, I added some hot sauce, seasonings, and a touch of soy sauce. At the farmer's market, I bought a big allium flower head with many beautiful little purple florets (I should take a picture). The farmer said this is edible and gives a nice garlic taste without lingering on the breath. It looks lovely and I've stored it sitting in water in the refrigerator. I believe this is called a garlic scape. Once I served the saute, I sprinkled some scapes (if that's what they're called) on top - they tasted great! 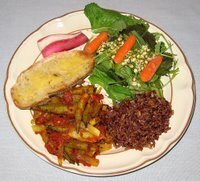 I also served heirloom tomato slices on toast, and radishes. I heated some organic canned lentil soup, as it was (surprisingly and refreshingly) a little cool after a late afternoon rain. I know I have been cooking with a lot of greens recently, but they are in season, taste good, and are nutritious. I have some mixed greens to use up in the coming days. I am going through a period with a number of days of not cooking. Yesterday, my wife and I joined two friends to enjoy an informational evening of tandem cycling, including an exhilirating ride at a bike store in Raleigh preceded by a quick dinner at Whole Foods. Thursday I will be teaching, and we're planning on going out. It's been too long since I've been out of the kitchen! I taught on Thursday and ate at my parents' house; on Friday, a group of friends joined my parents and I to see the film Water (I loved it on opening night and wanted to see it again), and I treated my parents and a friend to a South Indian dinner; and yesterday I made a mixed greens dish for a vegetarian society potluck dinner. Tonight, I took the leftover vegan "celebration roast", sliced it thin, and served it cold in a sandwich with lemon sourdough boule and mustard. At the farmer's market yesterday, they had some excellent looking salad greens with edible flowers mixed in; I served that, as well as French fries, avocado, and mild red pepper. 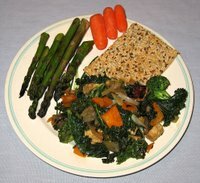 I heated leftover kale with tempeh that I had made on Wednesday to round out the meal. Tonight I prepared some kale. I began by sauteeing some onion, orange bell peppers, and tempeh in a large sauce pan; when the onion was nearly carmelized and the tempeh somewhat browned, I added in torn shreds of green kale, leaving the stems for my compost pile. I reduced the heat, added broccoli crowns, a little hot sauce, soy sauce, and Pluto's Caribbean Bliss mild spice mixture, plus a few tablespoons of water. I simmered the mixture, covered, for about 4 or 5 minutes. 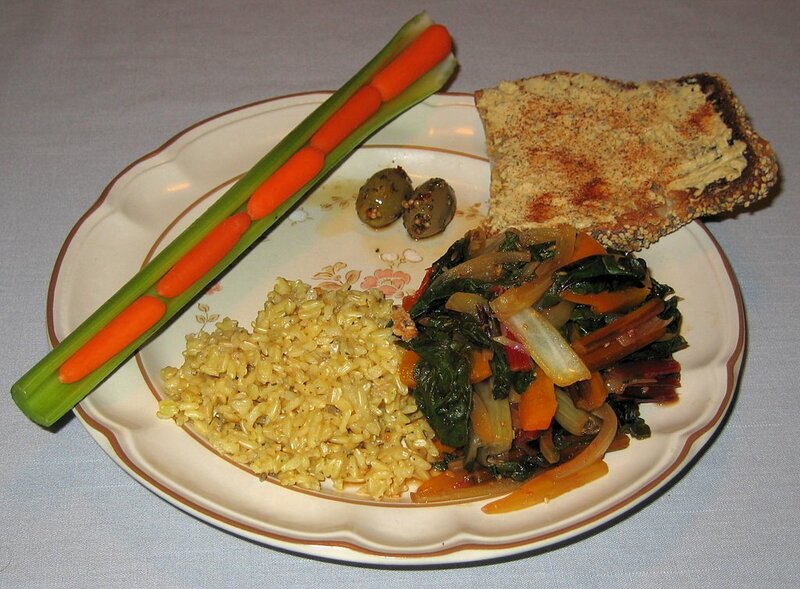 I served this with Doctor Kracker organic 3-seed flatbread and grilled asparagus.